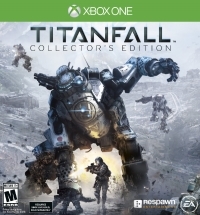 Description: Collector's edition of Titanfall featuring an 18 inch Titan model and artbook. This is a list of VGCollect users who have Titanfall - Collector's Edition in their Collection. This is a list of VGCollect users who have Titanfall - Collector's Edition in their Sell List. This is a list of VGCollect users who have Titanfall - Collector's Edition in their Wish List.